At this grey and murky time of year, Spring and Summer seem a long way off, so it's nice to have a colourful celebration to look forward to over the next couple of weeks. 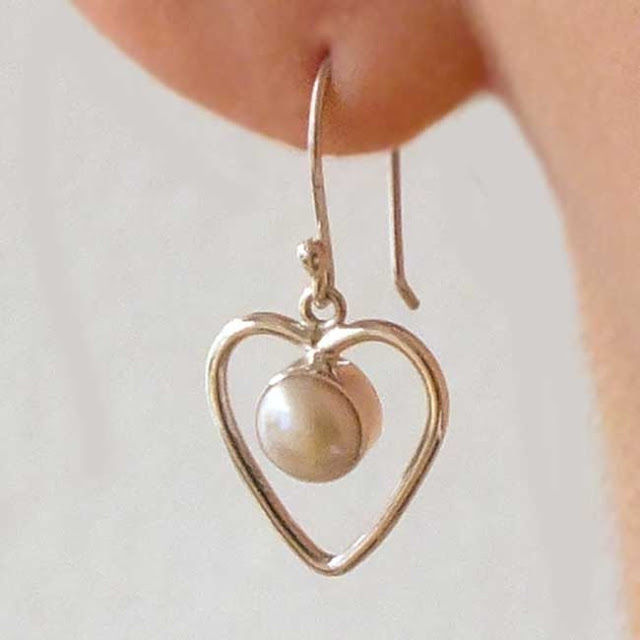 Here at The Earring Collection, we are preparing for St Valentine's Day and thought that it would be interesting to look into the history and traditions as well as presenting some of our love inspired jewellery! A pretty pearl in a heart. Romantic and delicate. Although February 14th is the traditionally associated with the Christian martyr St Valentine, it's origins as a day to celebrate love are believed to date from pagan times. The feast of 'Lupercalia' was a festival promoting fertility in Ancient Rome which was banned by the early Christians. Sterling silver and garnet pendant and chain, also available with peridot. Many variations of the story of St Valentine exist. In one version, St Valentine was a priest imprisoned for his faith who miraculously restored the sight of his jailer's daughter. He also declared undying love for her in a note, supposedly the origin of the 'Valentine's card. St Valentine was said to have worn a purple amethyst ring engraved with a cupid, (god of love and affection in the classical world) and this has led to the stone's association with the month of February as a 'birthstone'. Keys became a symbol of Valentine's day as the implication was that they could 'unlock' the heart and therefore promote love. In the 14th Century, Geoffrey Chaucer wrote of St Valentine's day as the time when birds choose their mates and William Shakespeare refers to Valentine's Day in 'Hamlet' in the early 17th Century. During the 19th Century, the mass production of cards and the widespread use of postage stamps saw a boom in the popularity of these celebrations and companies such as Cadbury used the heart motif to market confectionary. Gifts such as flowers and jewellery depicting the symbols of love also became more popular. Today, these traditional symbols of love are given as tokens of affection and here at The Earring Collection we have a wonderful selection available. 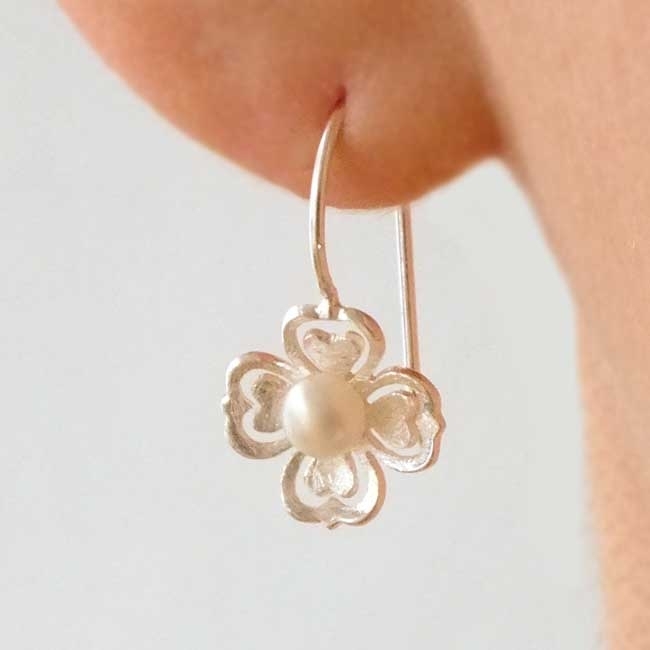 Very pretty earrings with a freshwater pearl held in a solid silver flower with heart-shaped petals. Could it be a more romantic design? 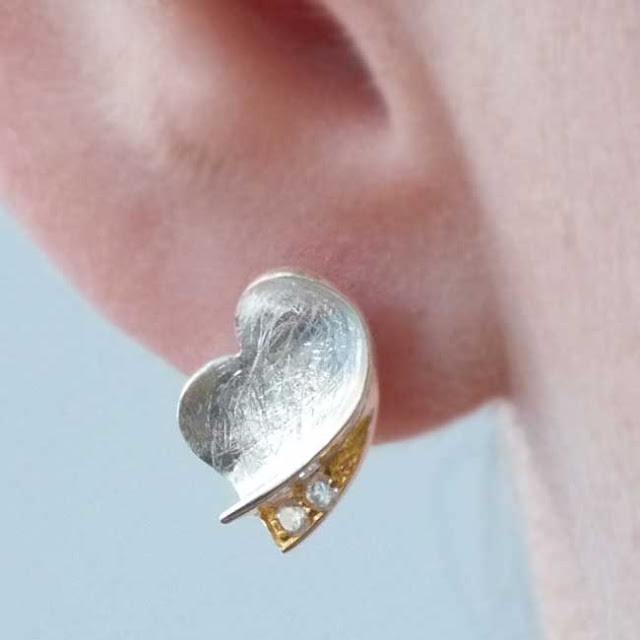 Pretty heart earrings in silver and rose gold. With a little sparkle of zircons!